Bitdefender Total Security 2013 continues to build on Bitdefender's history of top protection and performance, ease-of-use, and unique user experience. Comes with an increased focus on useful services such as Safebox, Device Anti-Theft, and Parental Control, but also on the secure and convenient management of your services.Its improved dashboard also allows you to view and even control installed applications and mobile devices. 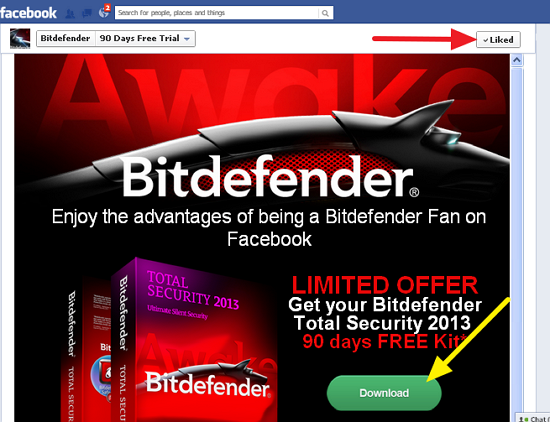 Go to Bitdefender Facebook fan page through this link. Then click the like button suddenly the page redirects and show the Download button like below. After you downloaded Total Security 2013 exe file install it your computer use it 90 days for free! !